Sign up to receive my blog posts via e-mail and get a copy of our popular eBook FREE. Don't hand the IRS a chunk of your wealth. Avoid these financially painful mistakes. 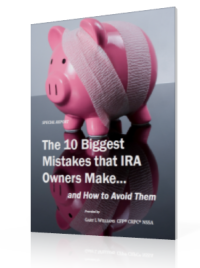 Get your copy of The 10 Biggest Mistakes that IRA Owners Make…and How to Avoid Them.